The following is the unofficial transcript of a CNBC interview with Senator Elizabeth Warren and CNBC’s Jim Cramer on “Mad Money w/ Jim Cramer” (M-F 6-7PM) today, Wednesday, August 15th. The following is a link to video of the interview on CNBC.com: https://www.cnbc.com/video/2018/08/15/sen-elizabeth-warren-trade-deals-help-companies-not-workers.html. JIM CRAMER: Senator, one of the things we talk about on Mad Money is that they’re more than just shareholders, they’re stakeholders. JIM CRAMER: You’ve produced a very thoughtful article in the Wall Street Journal about companies shouldn’t be accountable only to shareholders. Tell us about it. JIM CRAMER: And we’re coming back to it like, a — Salesforce is saying that. But the vast majority of are not coming back to it. ELIZABETH WARREN: That’s right. Stock market went up. Productivity goes up. And workers do better. We built the great American middle class. And then what happened? You start, basically, in the 1980s. And corporations start shifting over. And they say, “Wait, wait, wait. We have just one, single-minded focus. Shovel as much money as you can into the pockets of the shareholders. And forget about the rest of that stuff.” And the consequence has been that the shareholders have done really well. The 10% of Americans that owns more than 80% of all the stocks, shovel money in there. But workers, wages have flattened out. In fact, lately, it looks like hourly wages, adjusted for inflation, have gone down. ELIZABETH WARREN: No kidding, no kidding. But here’s the thing about all of that. It’s that it’s not even working long-term for the corporations themselves. We have seen, over the past 25 years, extraction of about $7 trillion of investment in America’s companies. That’s not how we build a long-term future. So I have a proposal to deal with it. And my proposal says, let’s get a little accountability into the system. And let’s get these corporations to charter, federally, the ones that have more than $1 billion of sales every year. And let’s have a couple of features. First one, let’s put some employees on the board. Let the employees elect some people. So you’ve got multiple representation on the board itself. Second one, let’s change the compensation structure for the CEOs to say that the CEOs will not be permitted to juice the price. And then once they juice the price, make a quick sale, make a bazillion dollars, and keep emphasizing the incentives. That’s what we’ve got now for short-termism. Wanna get rid of it. JIM CRAMER: Why– devil’s advocate. JIM CRAMER: If-- if your bill passes-- we know the way capitalism can work. It can be a little rogue. Would some companies say, "Tax on jobs, we'll just outsource. Tax on jobs, we'll hire temporary workers"? How do you get around that? ELIZABETH WARREN: No, no. This doesn't change anything. Let's be clear. This is no new taxes, and I wanna be really, really clear, it doesn't cost the American taxpayer a single penny. JIM CRAMER: So it's not anti-business. JIM CRAMER: Okay. Now, let's take a company like Costco. JIM CRAMER: -- best performer in the group. Why do we need legislation, when the examples of great stocks that actually embrace their workers are so evident? What is with the other guys? ELIZABETH WARREN: Oh, I get it. The problem you've got is we need to level the playing field, and that's what rules do. Because right now -- well, there are a couple of companies that are willing to show what it does for the companies. The CEOs understand the money is to be made in the companies that don't do that. The money is to be made in short-term juicing the stock. Look at the $1 trillion in buybacks that have occurred. That's not investment in these companies. That's nothing more than a sugar high for those companies in the short-term. Helps the top executives, but doesn't help the company long-term and sure doesn't help the employees and sure doesn't help the communities they're in. JIM CRAMER: Okay. Let's talk about the bigger picture of trade. JIM CRAMER: We-- need to worry, I believe and have felt that the industrial economy-- that there have been predator economies, like China, that have really hurt and targeted our industries. JIM CRAMER: Do we worry about, say, the steel industry, the way the current administration is? Because in the end, if it's rapacious and coming from overseas, we lose—the workers lose their jobs, not just their pay. How do you feel about it? ELIZABETH WARREN: So look, I've been a critic of trade policy in America, as you know. ELIZABETH WARREN: That's why you brought it up. 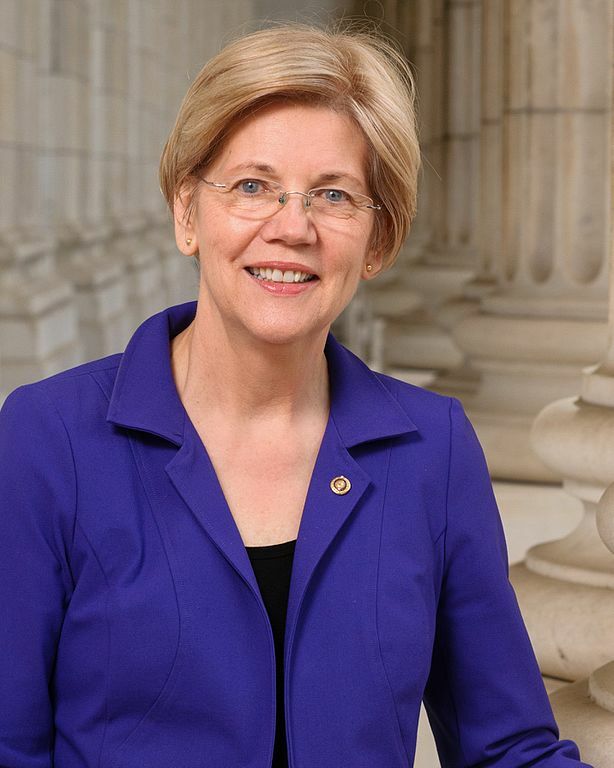 ELIZABETH WARREN: Because I've been on this for such a long time. JIM CRAMER: But you are not-- you are not-- you've been on this train for a long time. Because I follow you. You've always been concerned about the American worker losingtheir job 'cause of pred-- predators from overseas. ELIZABETH WARREN: And I am worried about trade policy that has been written largely by a handful of multinational corporations. That it has not been written to enrich Americans. It's been written to enrich those who pay above that sphere. And I'll give you one quick example, and that's enforcement of the promises in the trade deals. You know, they put labor promises in. They put environmental promises in. They put the level-playing-field promises in those trade deals. Good luck on getting them enforced. But for the giant, multinationals, there's a special, special deal. And the special deal is, if they don't like a new regulation that gets passed after they've cut a trade deal, they get to go to a special fast-track arbitration outfit made up of corporate lawyers. They come in and make their case that Canada shouldn't be able to prohibit this particular chemical, or the United States is doing X, or Mexico's doing Y, that they don't like, and it cuts into profits. A handful of corporate lawyers make a decision. Are you ready? They hand down that decision. And either the-- the country changes its law or makes a big payment. No going through a court system, no appeals, no nothing. That's just saying, in effect, trade deals are written for the guys who run these big multinationals, not for the American people. JIM CRAMER: Now, Senator Warren, you know that Peter Navarro, who's a very close advisor to President Trump, if he were sitting here, he would probably say that chapter and verse. Does it bother you that you're basically on the same side as someone who's the chief trade advisor to the president? JIM CRAMER: Yeah, the stock market goes up, too. ELIZABETH WARREN: --that's what this is about. JIM CRAMER: You know that. Individual stocks go up. JIM CRAMER: Now, I-- I want people to understand the context. I mean, a lot of people think you're just this left-wing firebrand. Isn't what you describe the way this country was in 1980? JIM CRAMER: Well-- well, okay. Where was the cop on the beat on Wells Fargo? JIM CRAMER: It was terrible for the employees. JIM CRAMER: -- and, by the way, and boost the profits of multinationals. That's not talked about that much. JIM CRAMER: What you're-- you're-- you're-- you're fine being aligned on-- on this particular issue? JIM CRAMER: I-- I know this is a loaded question. But the people listening will say, "She must be running for president." What do we say to that? ELIZABETH WARREN: You know, look, these are-- first of all, I am running for Senate, 83 more days, Massachusetts-- 2018. But let me say, these are the things I've worked on all my life, Jim. ELIZABETH WARREN: You know that. ELIZABETH WARREN: We've got to get this country to work for all of us. JIM CRAMER: All right, Senator Elizabeth Warren, thank you so much. ELIZABETH WARREN: You bet. Good to see you.